Gravity is composed of over 120 eggs laid by one chicken, Spunky. 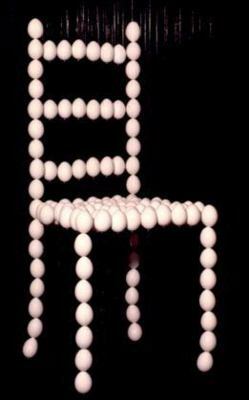 The eggs are suspended on very fine monofilament (Invisible thread) from a grid about 12 feet above the ground. Tiny lead sinkers stop the eggs from sliding off the lines. Some time after it was started in Canada, I added a base, housing a motion sensitive alarm and electromagnets. The alarm triggers movement once when motion is initially sensed, and then again after 20 seconds of stillness. It was very sensitive and had a long range -- unfortunately, many people assumed it was broken. I intend for it to work fashioned after the behaviour of small animals in the wild: where initially one's presence is sensed, and after a period of time has passed... trust is established.